There can be such a thing as milking a good idea too far, and 20th Century Fox milked its Planet Of The Apes license until its teats turned blue, then black, and then fell off altogether. Based upon the novel by reluctant Frenchman Pierre Boulle, Planet Of The Apes spawned fives movies, an animated TV series, and a live-action TV series. By the law of diminishing returns, the quality of the franchise deteriorated the more it was watered down by the salty piddle of subsequent installments. Released in 1968, the original Apes movie had been considered a risk by all but its determined producer, Arthur P Jacobs. Even Boulle considered the novel to be one of his worst books, and everyone viewed the central premise – talking monkeys interacting with humans – as a recipe for disaster. Indeed, Fox’s previous beast-o-speak flick, Doctor Dolittle, was a vast flop for the studio. The fact it had been produced by one Arthur P Jacobs wasn’t lost on Fox’s money men. Also, the only sci-fi movie to have done moderately well during the Sixties was Stanley Kubrick’s impenetrable 2001: A Space Odyssey. Nobody except for hippies knew what that crap was all about… but it did feature some monkeys. Having spent three years pitching the book around Hollywood, Jacobs enlisted Charlton Heston, and Oscar-winning make-up artist John Chambers, to help him create a test sequence featuring Heston, as the human astronaut Taylor, interacting with Dr Zaius, the orange-u… oringootan… the ginger monkey. Satisfied that people weren’t going to laugh at what was intended to be a serious piece, and impressed by the make-up tests, Fox greenlighted the movie, hiring Twilight Zone creator Rod Serling to pen the screenplay. Due to budgetary restrictions, Planet Of The Apes differed significantly from the novel, in which the apes live on a potentially budget-busting, high-tech Earth-like planet, drive cars, fly helicopters, watch television – basically everything we humans do. Including, presumably, falling over in kebab shops after a particularly heavy night on the ale. 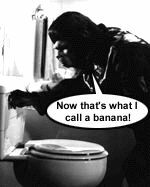 Therefore the future earth of the Planet Of The Apes was kept relatively primitive to ensure the budget remained viable. Helicopters were replaced by horsies, skyscrapers by stucco abodes, and high-tech televisions were replaced by spectator sports where horsie-riding monkeys chased after humans and shot them in the neck. As is our understanding anyway. Nevertheless, it was an expensive movie to make, primarily due to the make-up demands. Throughout the duration of filming, other Hollywood productions ground to a halt due to the fact that the majority of the town’s make-up personnel were busy making hundreds of extras into un-cheeky monkeys. The first Apes movie was a huge success, and remains a sci-fi classic to this day. Among the most memorable sequences was the scene where Taylor reveals his secret with the line: "Take your stinkin' paws off me, you damn dirty ape." Heston’s throaty rasp wasn’t just good acting – it was the result of a throat infection the actor contracted during filming. Yet it’s the final iconic shot of the bombed-up Statue Of Liberty which most film-goers remember. However, presumably because he’s an idiot, Pierre Boulle practically disowned the movie due to this one element. Unfortunately, things went down hill for the series from there. Heston reluctantly agreed to return for the sequel, Beneath The Planet Of The Apes – but only as a favour to Jacobs - though chirpy chimp Roddy McDowell refused to reprise his role as Cornelius. The movie was nevertheless a success, but the element of surprise was gone, and attempts to recreate the shock ending of the original by destroying the Earth, proved too much of a downer, no matter how amusing you may have found the previous 90 minutes of ape/subterranean bald-headed human mutant shenanigans. Lured by the promise of all the bananas he could eat, McDowell was back in the second sequel, Escape From The Planet Of The Apes, in which Cornelius and his wife escaped from the detonating planet by travelling through time to the past. Suffice to say, seeing a couple of chimps strutting around in 1970s flares and wide-collars went way beyond the absurd. Even the traditional downbeat ending failed to wash away the stench of farce. The subsequent movie, Conquest Of The Planet Of The Apes, saw monkeys employed as slaves, and rebelling against their human captors. It was rubbish, but not as rubbish as the low-budget final instalment in the big screen series, Battle For The Planet Of The Apes. One final desperate effort to recreate the shock ending of the original movie, by having a massive stone phallus rising up through the desert sands, emblazoned with the legend “HERE LIES AMERICA”, was considered a failure. The short-lived live action and animated series returned to the far future setting of the original movie, and reprised the basic premise, with a couple of dishy human astronauts arriving to wave their willies at ape society. Unfortunately, there was something less appealing about a couple of funky 70s dude strutting around in suede trousers and waistcoats, than there was in watching Charlton Heston dart about in his flapping loincloth. Constant rumours of an Oliver Stone-produced, Arnold Schwarzenegger-starring Apes remake continue to rebound across Hollywood. Suffice to say, the prospect of an Apes conspiracy movie about the horrors of war in which Schwarzenegger puns his way through swathes of gorillas isn’t particularly appealing. 1. What was the name of Cornelius the chimpanzee’s wife? 2. Which of these books was also written by Pierre Boulle? 3. Which Zone were apes forbidden to enter? 4. In a scene from the original movie - which was shot, but removed before release - what was Taylor’s girlfriend, Nova, revealed to be? 5. How long did it take to apply the original ape make-up?